Europe's Venus Express probe has returned its first images since slipping into orbit around our nearest planetary neighbour on Tuesday. They show the hothouse planet's south pole from a distance of 206,452km. 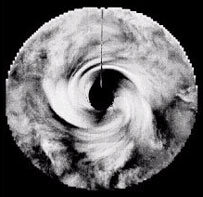 Mission scientists are already intrigued by a dark "vortex" feature which can be clearly seen in one image. Venus Express will orbit the planet for about 500 Earth days to study its atmosphere, which is thought to have undergone runaway greenhouse warming. Venus' dense, largely carbon dioxide, atmosphere acts as a blanket, trapping incoming solar radiation to heat the surface to an average temperature of 467C (872F) - hot enough to melt lead. Experts had previously suspected the south pole might have a vortex feature; a vast vortex with an unusual double-eye feature has already been observed over the planet's north pole. But the south polar region has scarcely been observed. "We can see there is a twister here that is similar to that which we know from the north pole," said mission scientist Horst Uwe Keller. Venus Express science team members say they want to know how these vortices remain stable and where they get their energy from. European Space Agency (Esa) officials said the pictures were "surprisingly clear", with "unexpected detail". 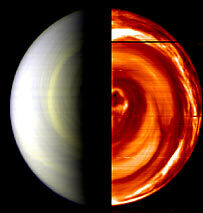 They were captured on 12 April by the Virtis (Visible and Infrared Thermal Imaging Spectrometer) and Venus Monitoring Camera (VMC) instruments onboard, as the spacecraft passed below the planet in an elliptical arc. The false-colour Virtis composite image shows Venus' day side at left and night side at right, and corresponds to a scale of 50km per pixel. The spectacular night half was taken via an infrared filter and shows dynamic spiral cloud structures in the lower atmosphere, around 55km in altitude. 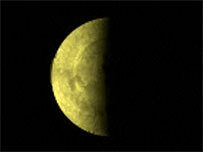 The smaller VMC image shows Venus at a scale of 150km per pixel and is also shown in false colour. It was imaged in the ultraviolet part of the spectrum. Venus Express successfully executed a 50-minute main engine burn on Tuesday designed to slow its speed enough to be captured by the planet's gravitational pull. As the spacecraft tightens its orbit in the coming months, scientists expect it to capture more detailed and revealing images of the planet. The mission is the first to be sent to the planet in 15 years.